How would it be to change your life with new and infinite possibilities? I never thought I would work with the Access® Bars. I had a radical and closed minded point of view that it wasn’t for me. I thought there were too many people doing this already. Until one day it touched me in a very unexpected way. And when I made the choice to open myself, everything changed. I began to have a more thriving life. I didn’t have a place to live with my children, this place arose exactly how I wanted. People who were more aligned with my life purpose turned up to work with me. And, indeed, facility came in a abundant way. That’s why I became a Facilitator. So that more people can access what I have accessed. A more integrated and connected world is what I expect. The Access® Bars are 32 points located in the head that when softly touched and without effort, liberate, with facility, anything that doesn’t allow you receive and have more consciousness. These points contains all thoughts, ideas, beliefs, emotions and considerations stored during a lifetime. Activating them it’s an opportunity of cleaning these files. This technique it’s a dynamic process, easy and effective to liberate limitations that prevent you from enjoying your life and be who you really are. The reports of the benefits from the Access® Bars are many and in different areas, including relaxation, greater disposition, mental clarity, more sleep quality, pain decrease, more creativity, well-being etc. The course will take place from 8am until 6pm, approximately, and through the course you will receive and offer two sessions. 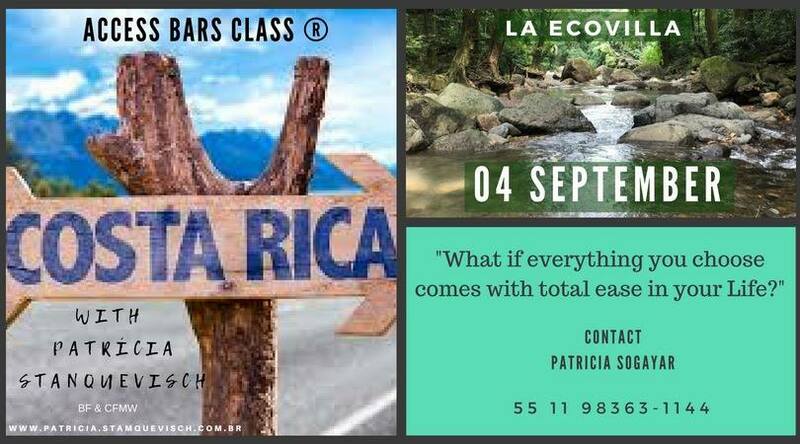 At the end you will become a Bars Practitioner, as well will receive an internationally recognized certificate. From then on, you will be able to apply the technique to other people, including professionally. If you are repeting the class or if you have between 16-17 years old, the value corresponds to 50% of the total. Children aged 15 years old or less receive a free class when they are accompanied by a paying adult. If you always knew there must be something more, better and possible, would It be now the time to start? How can I contribute to transform your life? Come find out. O curso ocorrerá das 8:00 h às18:00 h, aproximadamente, e durante ele você receberá e oferecerá duas sessões. Ao final você será um Praticante de Barras, bem como receberá um certificado reconhecido internacionalmente. A partir daí, poderá aplicar a técnica em outras pessoas, inclusive profissionalmente.